Everything you need to know to build your own custom fiberglass body at home. This almost four-hour 2-DVD set takes you step by step through building your own hot rod fiberglass body creation. No expensive tools or big fancy shop used or needed. Yes, you can build your own custom hot rod fiberglass body at home. The roots of custom hot rod fiberglass bodies go back to the 1950s and the creation of Ed “Big Daddy” Roth’s “Outlaw” T-inspired roadster. Back then, Roth invented his own low-buck way of making a custom fiberglass body from scratch. His plaster, vermiculite and newspaper “spitballs” formula, though, was a mystery even to those who read his long lost booklet on the subject. The grainy photos and sparse text really didn’t clearly explain Roth’s alchemy and most thought it was only something that could be successfully done by the consummate artist, Big Daddy, himself. Then, Fritz Schenck came along. Thank God for that. Fritz is a renaissance man, cross between artist and gearhead, who’s been building custom show rods for over 30 years. 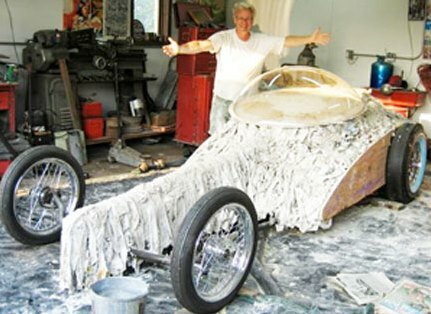 And he’s successfully mastered Big Daddy’s black art way of building a custom fiberglass hot rod body, as you’ll note from the photo above of his own fiberglass body Roswell Rod. Thanks to video technology, Fritz is now revealing in complete detail how to build your own custom fiberglass body at home! This is the DVD set that everyone has been asking for. Everything you need to know to build your own custom fiberglass body. Fritz takes you step by step as he builds his own creation from nothing and you can too. No expensive tools or big fancy shop, just Fritz in his two car garage at home. Learn how to make your own one-of-a-kind professional quality show car fiberglass body. There won’t be another one anywhere like it. You’ll see the creation of Fritz’s latest fiberglass body show rod, the Baja Bandeeto. Fritz starts with a hand built chassis made from junk parts and scrap steel. He uses a motor and parts from the junkyard. Then you will see it all come together from a plaster buck, laying down fiberglass, attaching the body to the frame, even making a ring for the bubble top, Fritz’s signature feature taken from the days when show cars were “show” cars. You will be amazed what you can do! With a few simple ingredients you can create a masterpiece. Fritz shows how anyone can do this, at home. It doesn’t take a lot of special tools — just a lot of hard work. With this almost four-hour 2-DVD set you get a ton of fiberglass body building know how. You’re probably curious what the end result actually looks like. Feast your eyes on both the “Baja Bandeeto” (below) and “Roswell Rod” (top of page) show rods with custom fiberglass bodies built by Fritz using the techniques revealed in the DVD. Now it’s time to see how easy it is to create your own fiberglass body magic when you’ve got the precise, practical instruction this DVD set delivers. 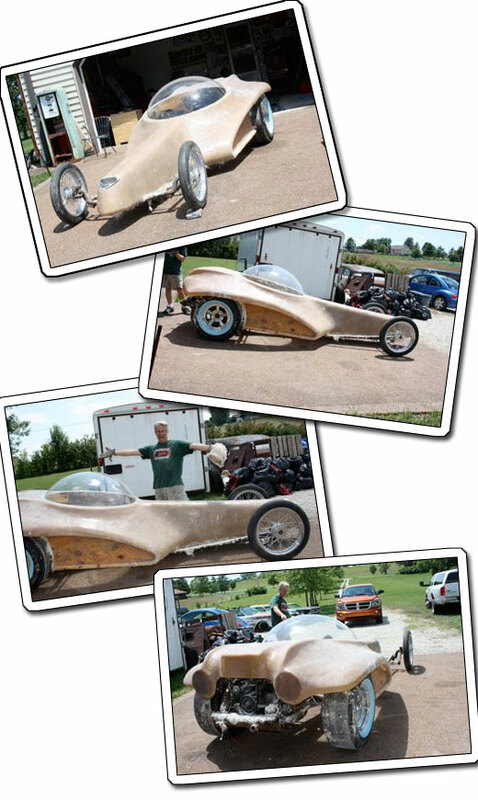 Build a Fiberglass Body at Home is not only four hours of clear easy-to-follow instruction, but it’s also incredibly entertaining because Fritz is a showman at heart — and he loves to get cool results from a very tight budget! Just click on the “Add to Cart” button to purchase with your credit card through the secure PayPal gateway and your DVDs will be promptly on their way to you. Mustang II Front Suspension — Build Your Own for a Fraction of the Cost!